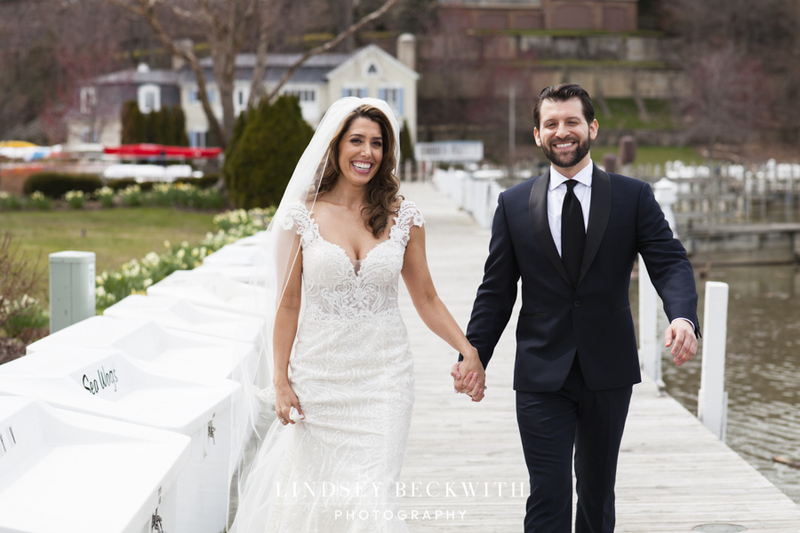 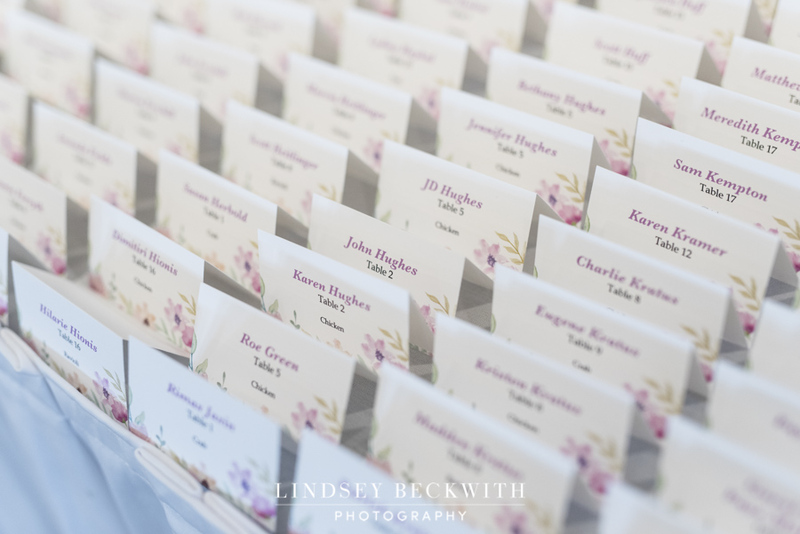 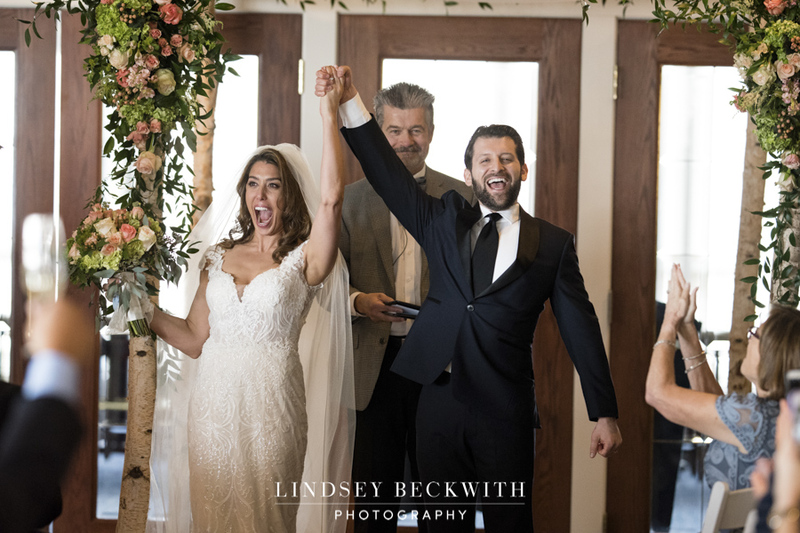 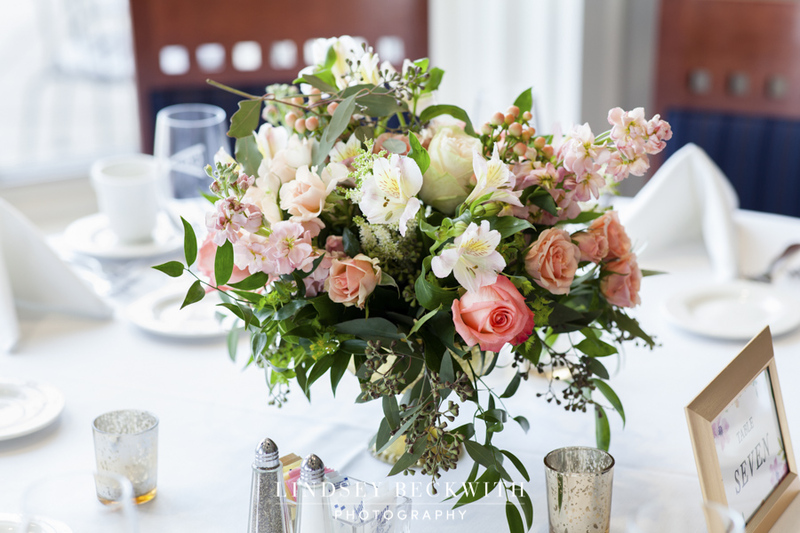 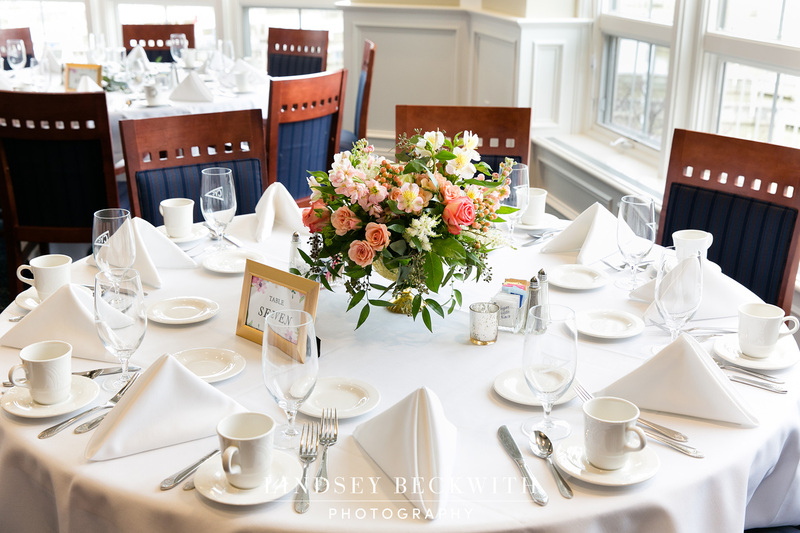 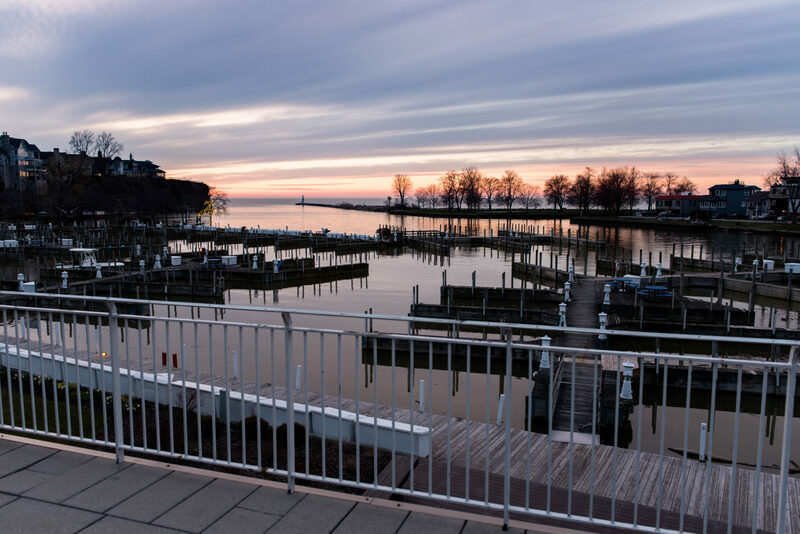 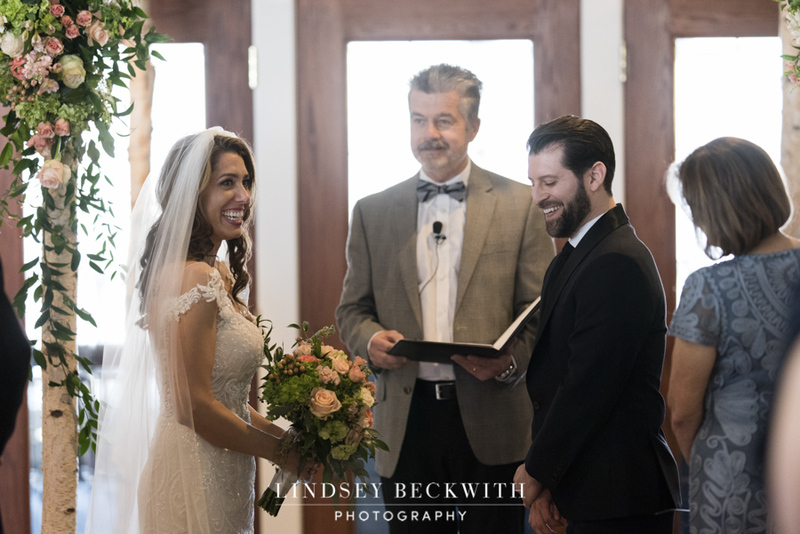 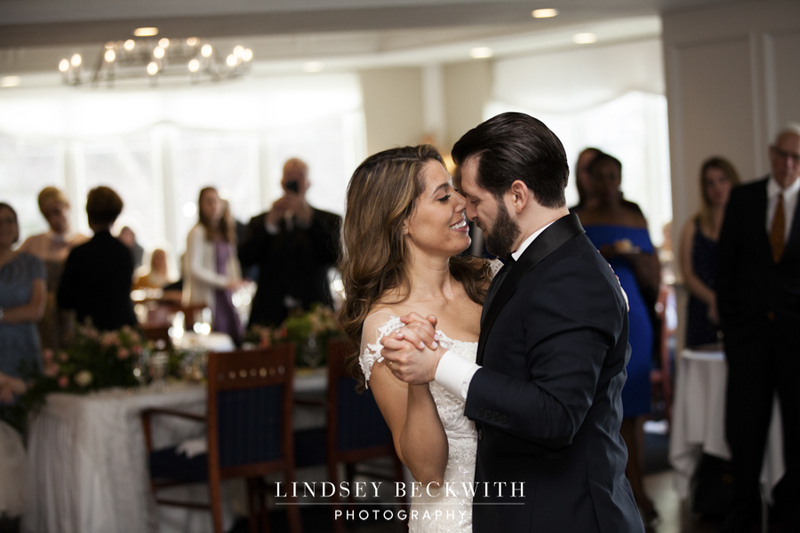 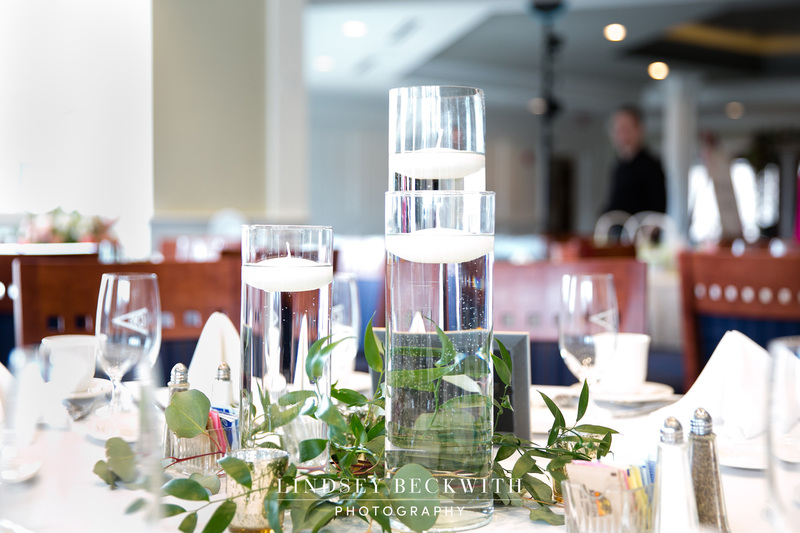 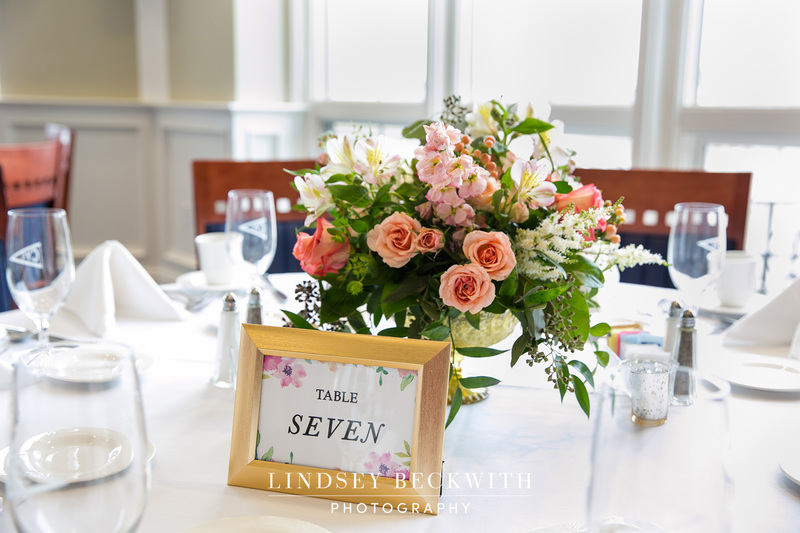 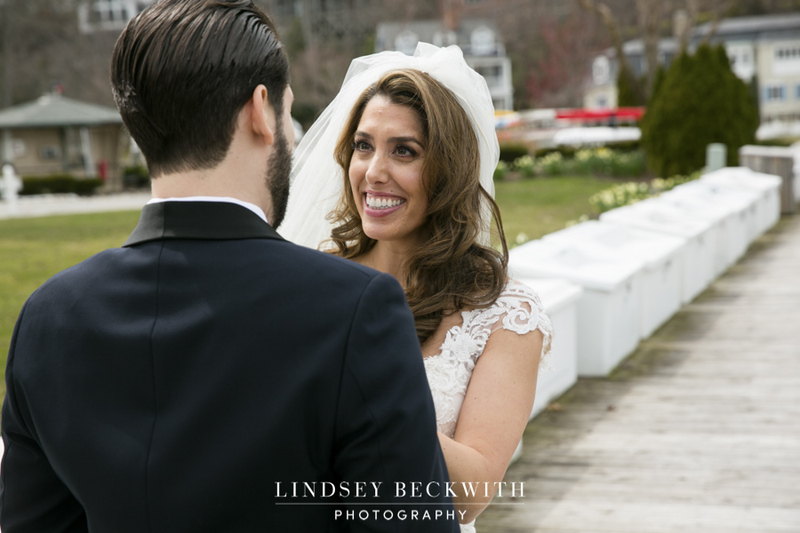 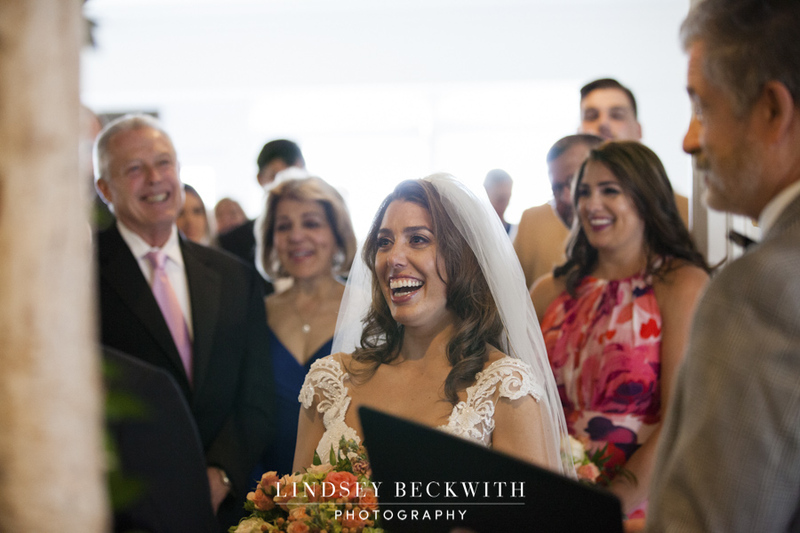 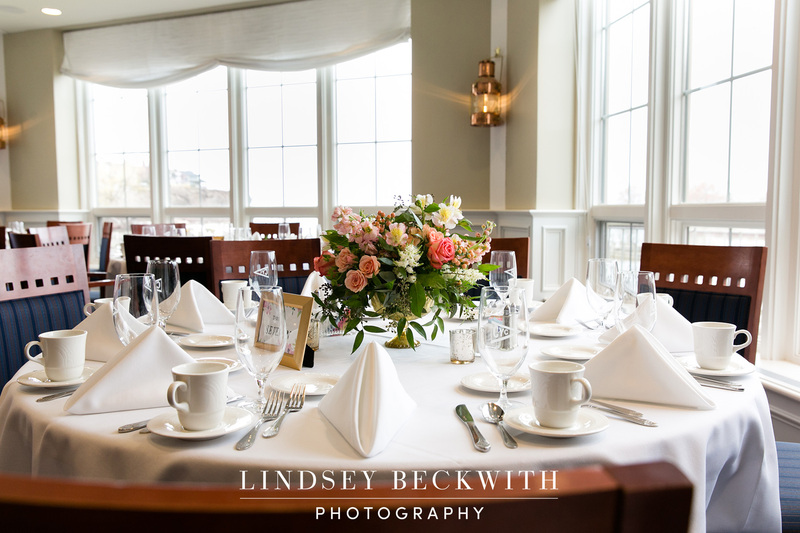 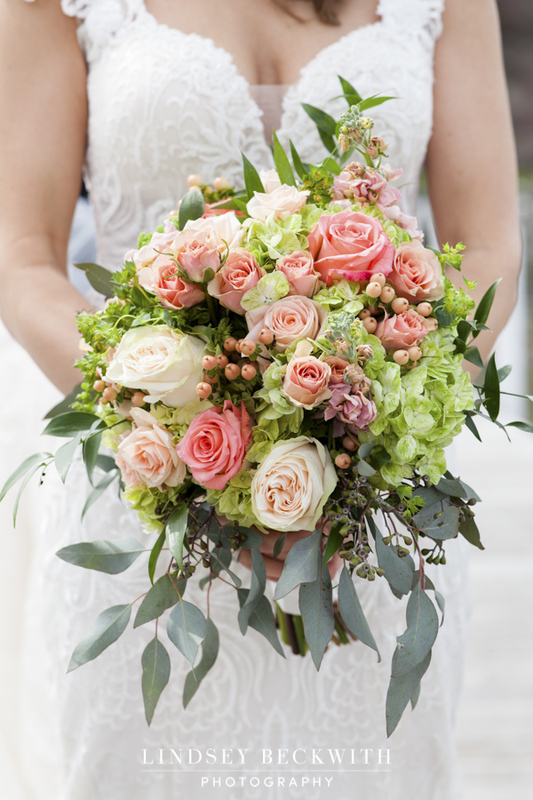 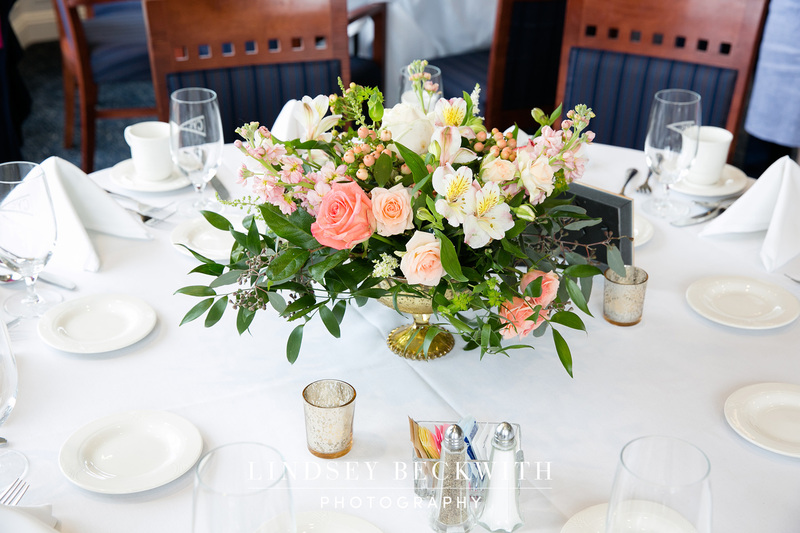 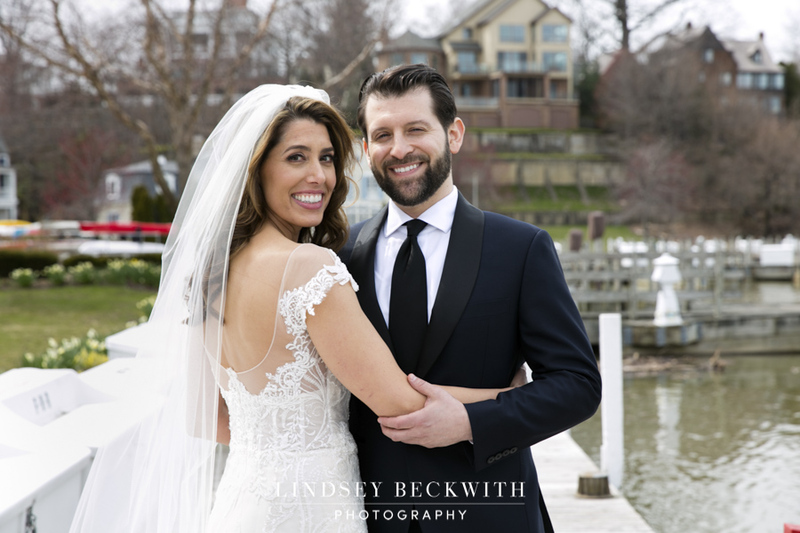 Kelly and David’s navy and white lakeside wedding at Cleveland Yachting Club was a classy, modern affair with touches of pink and green–and all the love and excitement you’d want in a wedding. 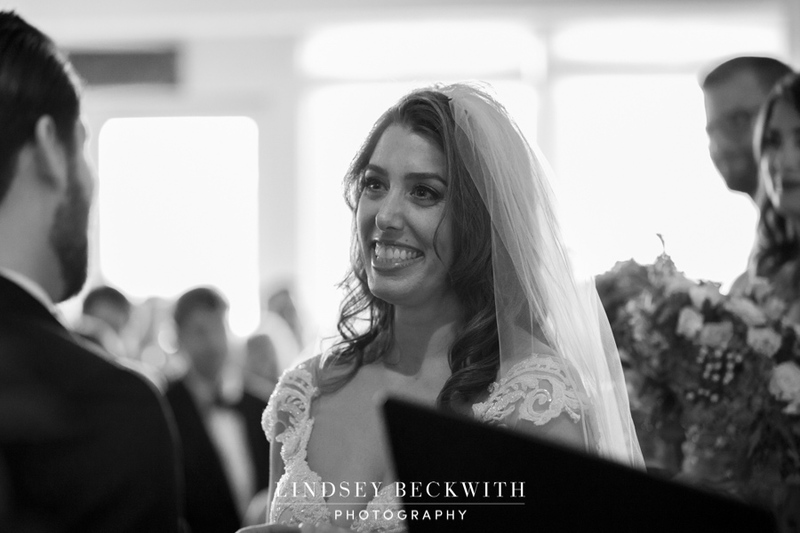 The first time I Skyped with Kelly, I was drawn to her bubbly energy and enthusiasm. 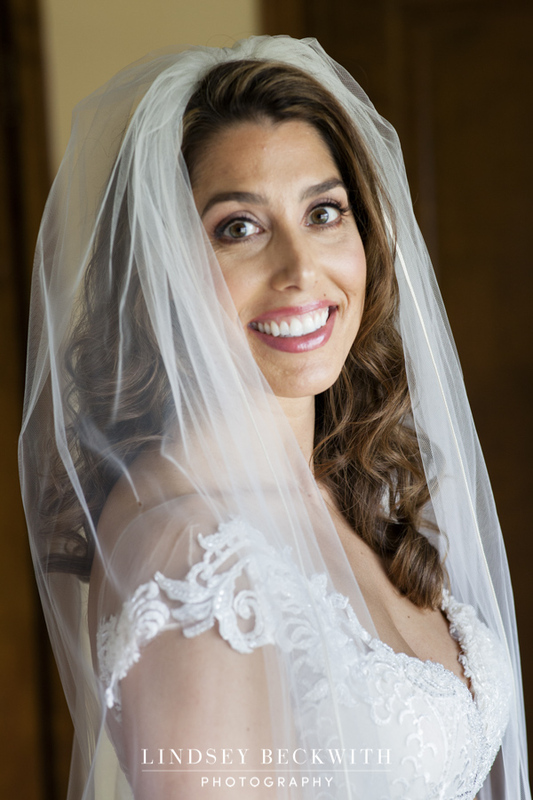 She had a definite plan for her wedding: let the vendors sweat the small stuff, and she was there to get married. 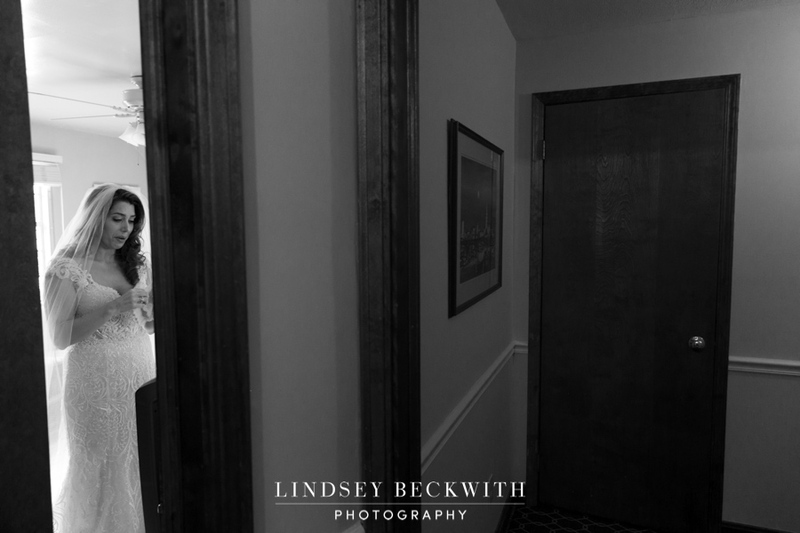 I met up with Kelly at her parents’ house in Rocky River, where her sister helped her into her dress. 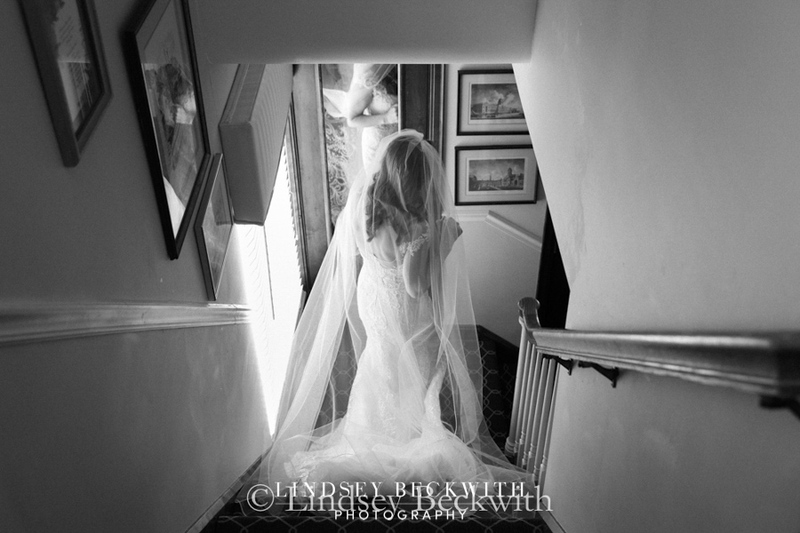 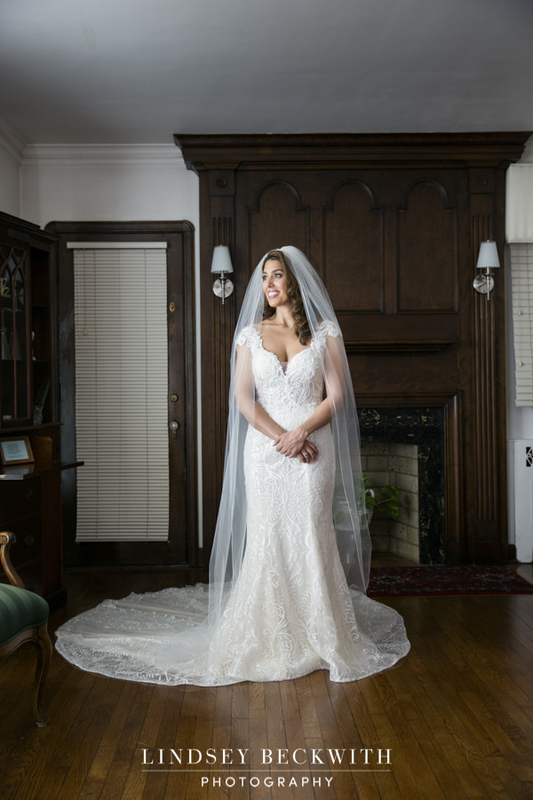 Once she was ready, she waited downstairs for an emotional first look with her mother and father. 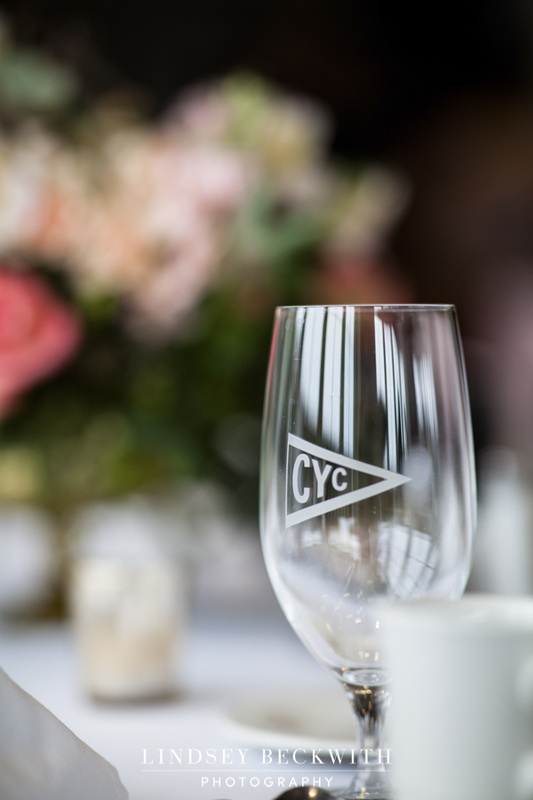 Meanwhile, David waited at the Cleveland Yachting Club. 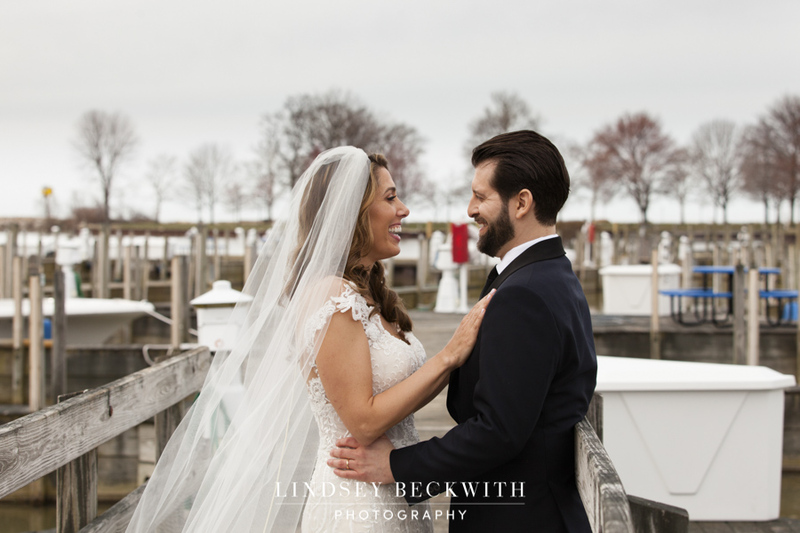 We made sure he was nowhere near a window when Kelly arrived, and ushered her to the dock. 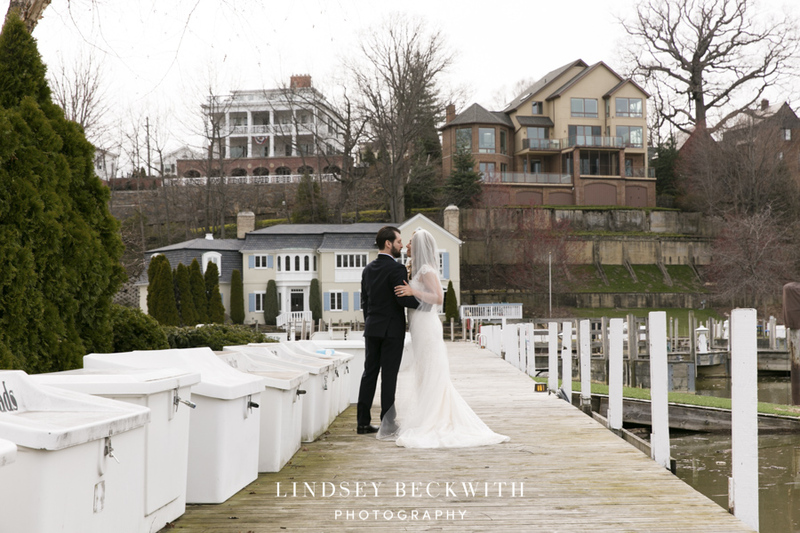 With a backdrop of boats and water, they had their first look by the lake. 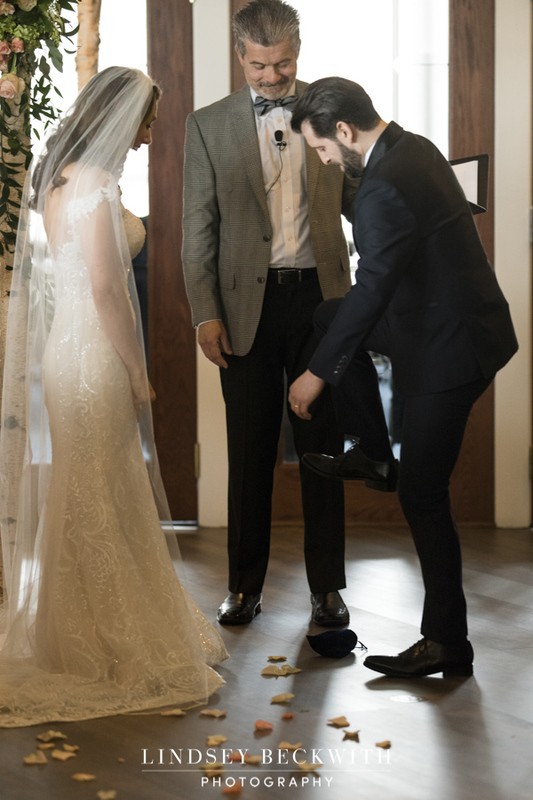 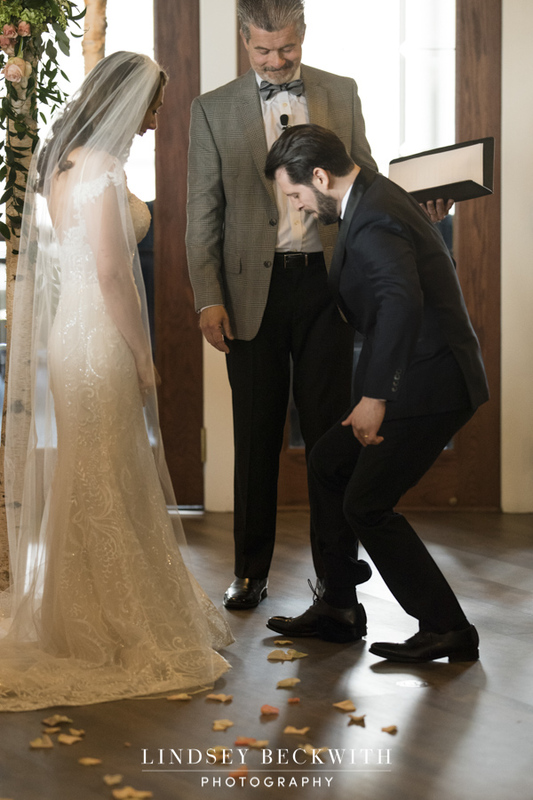 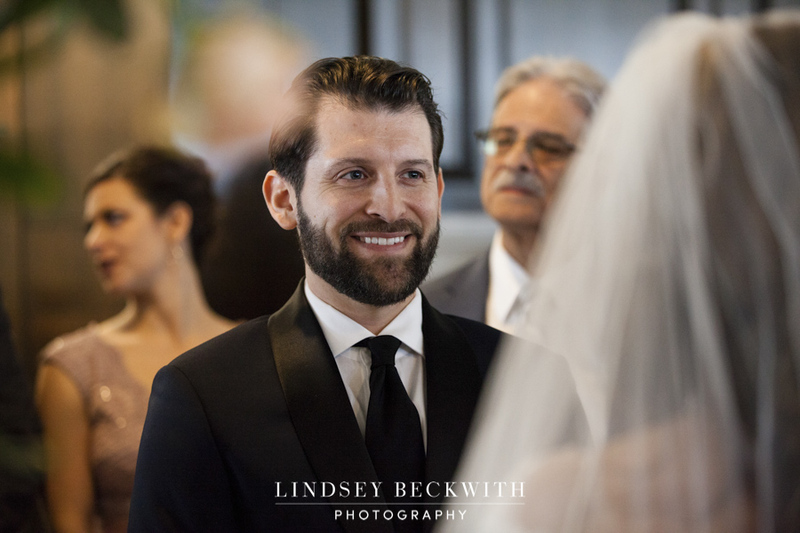 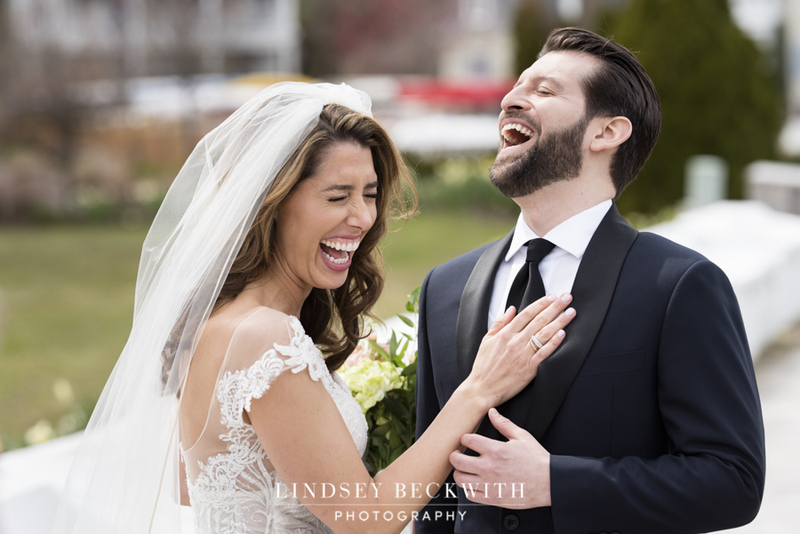 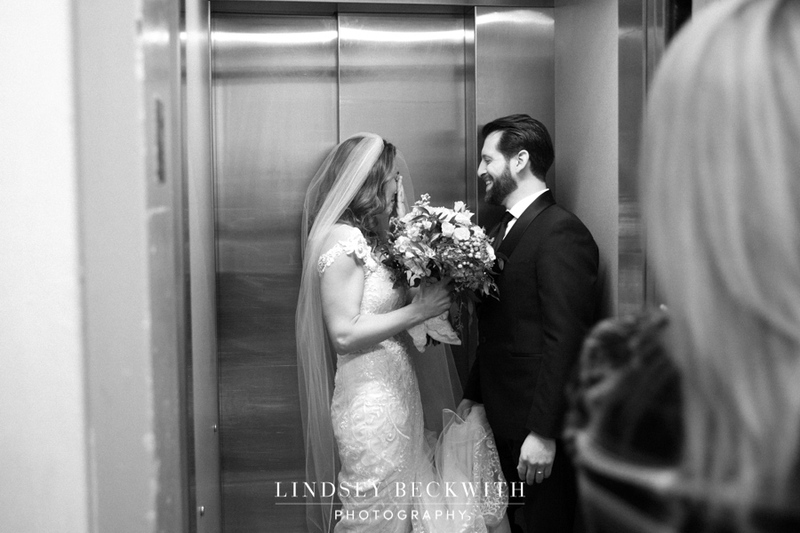 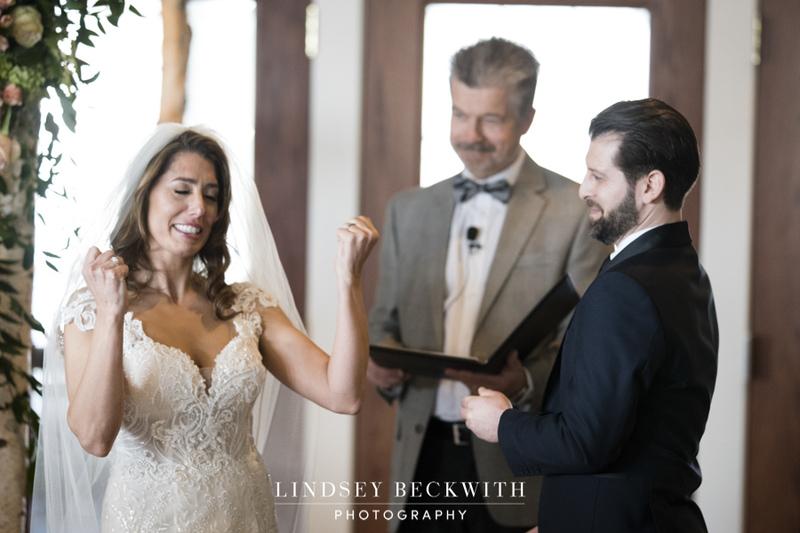 David closed his eyes and allowed himself to be lead outside where Kelly was waiting, perfectly fluffed and ready for him to see her for the first time on their wedding day. 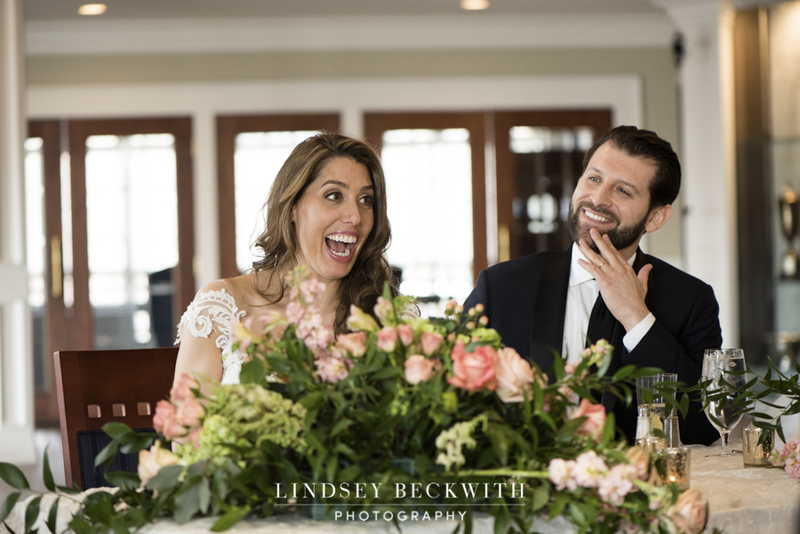 When he opened his eyes, his reaction was priceless. 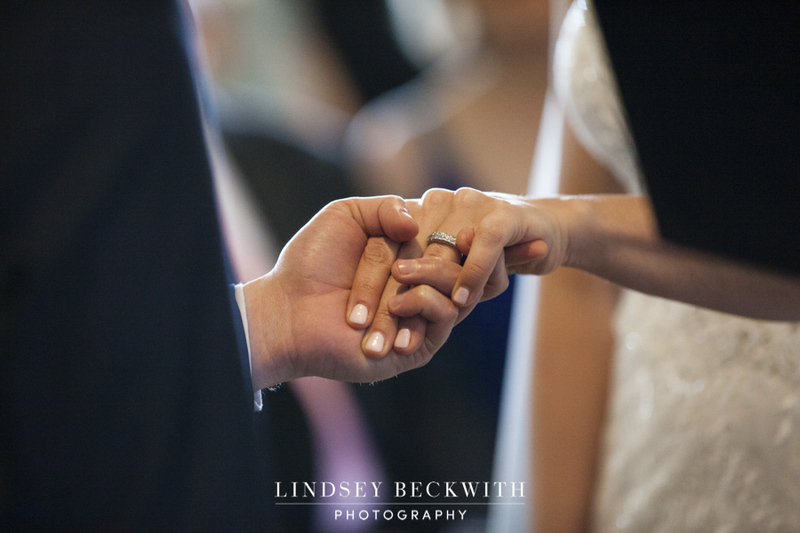 He beamed and strode toward her with his arms out. 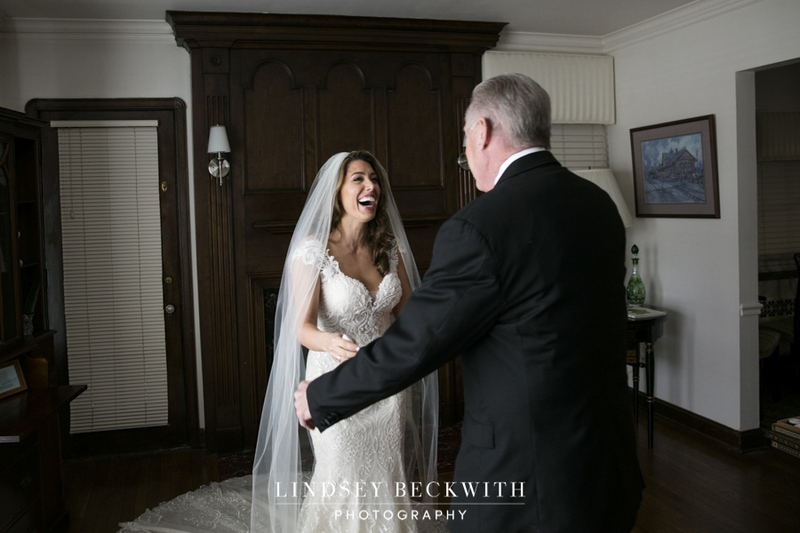 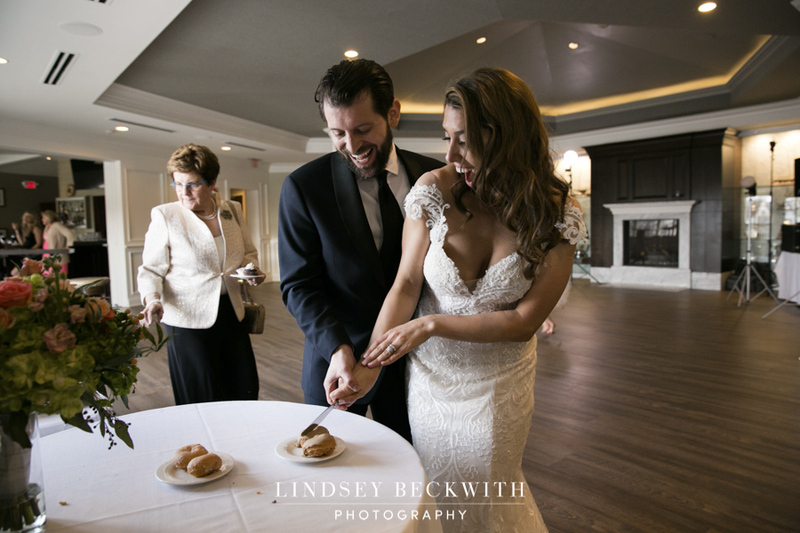 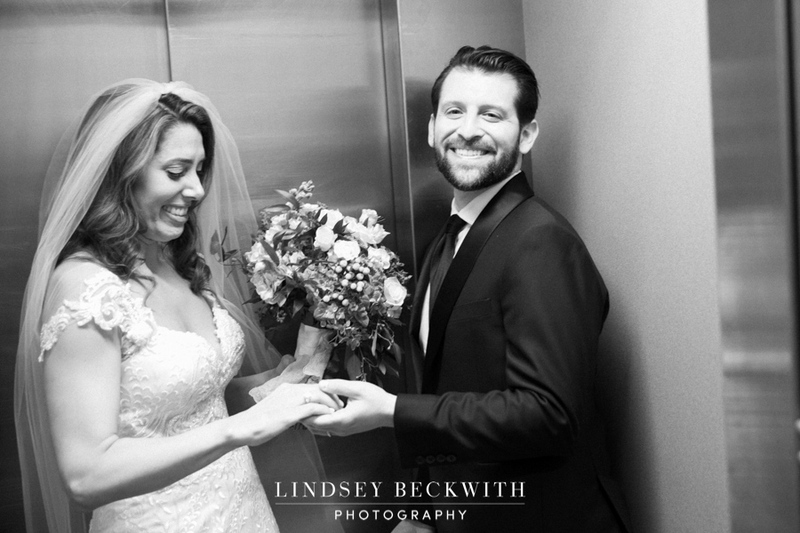 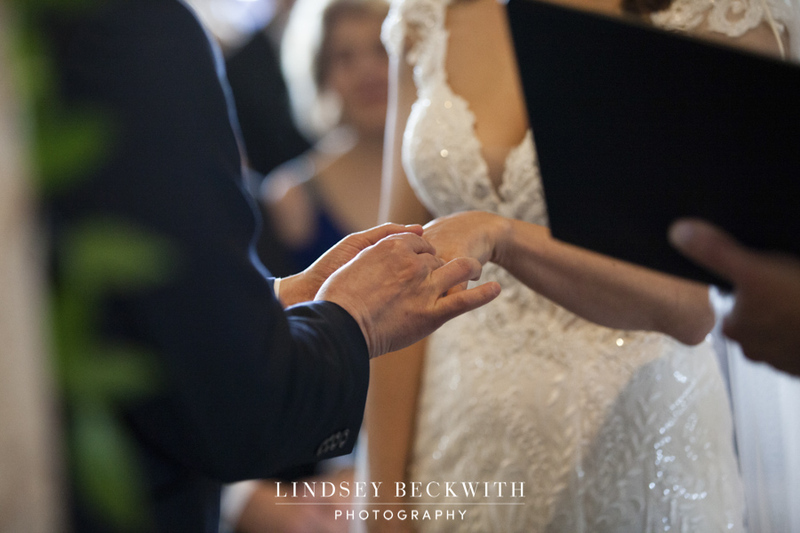 Her excitement at seeing him, showing him her dress, and simply getting the wedding day started, was contagious. 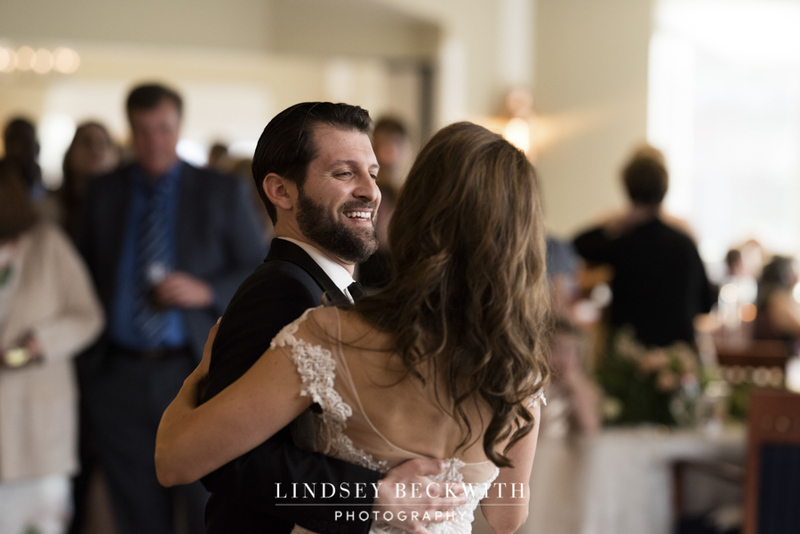 I could tell the world dropped away once they saw each other. 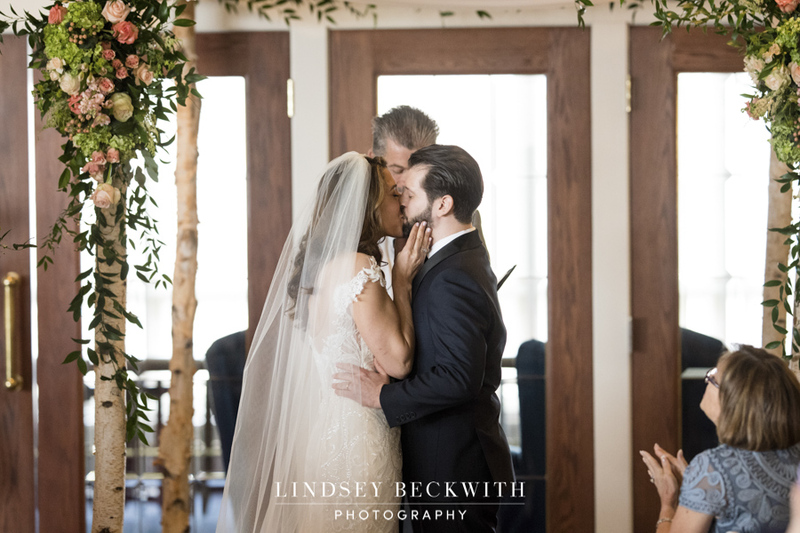 Next we did family photos, and then it was time for the indoor ceremony. 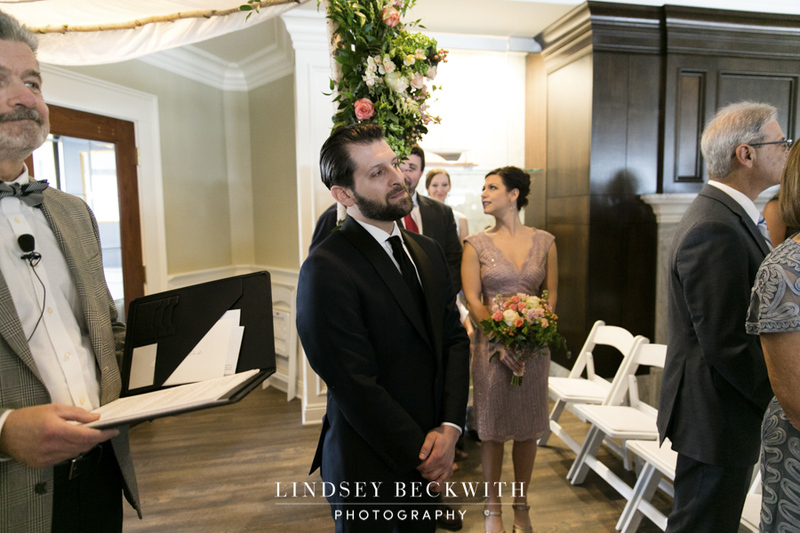 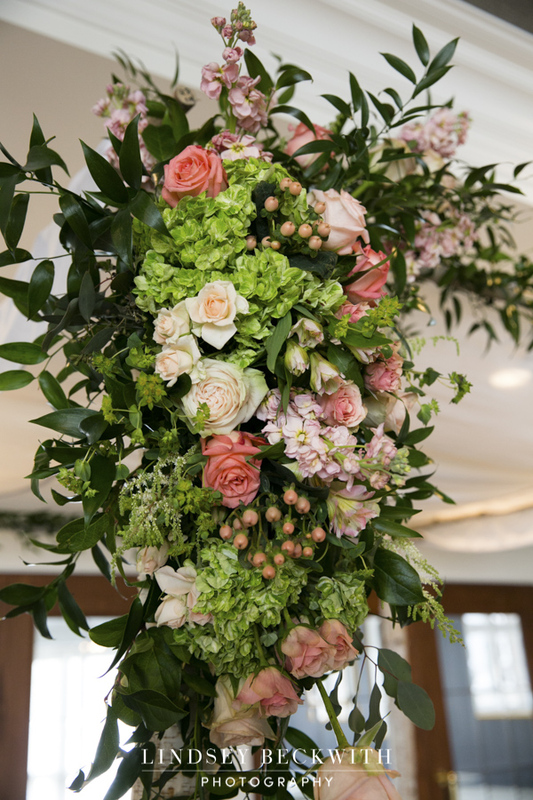 The chuppah was beautifully decorated with pink and green flowers, and the guests were waiting. 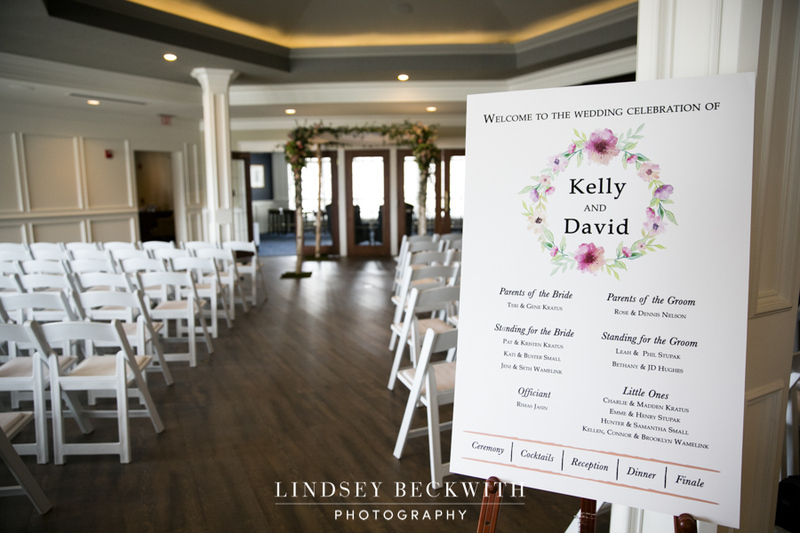 David peered through the guests, waiting to see Kelly. 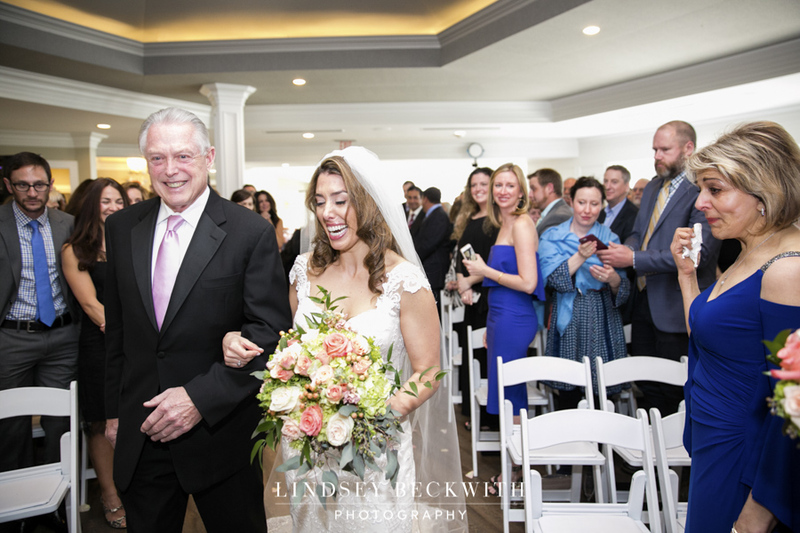 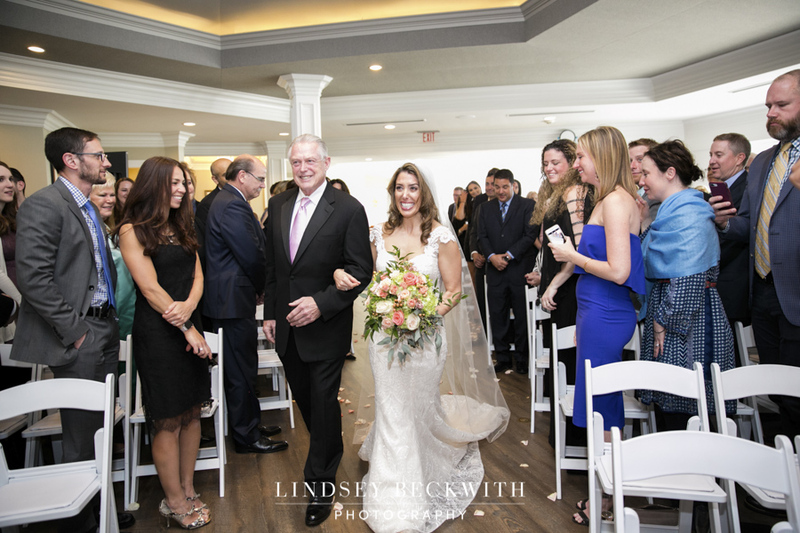 She walked down the aisle on her father’s arm, crying happy tears. 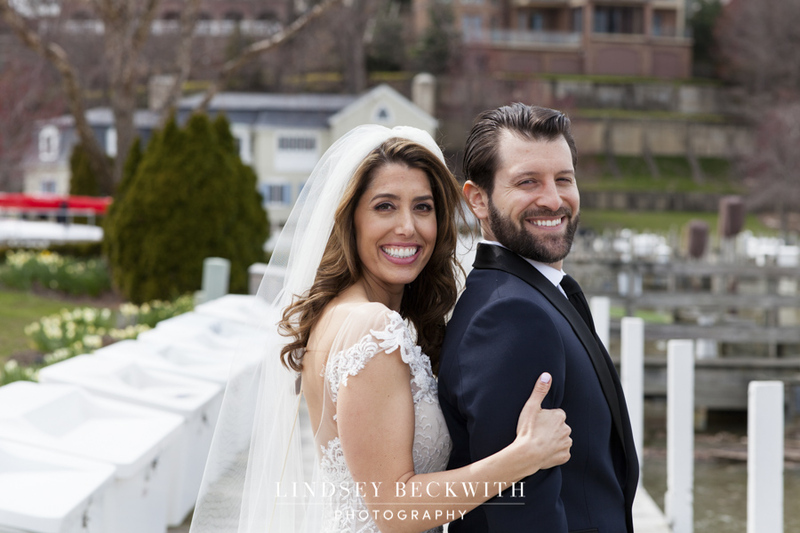 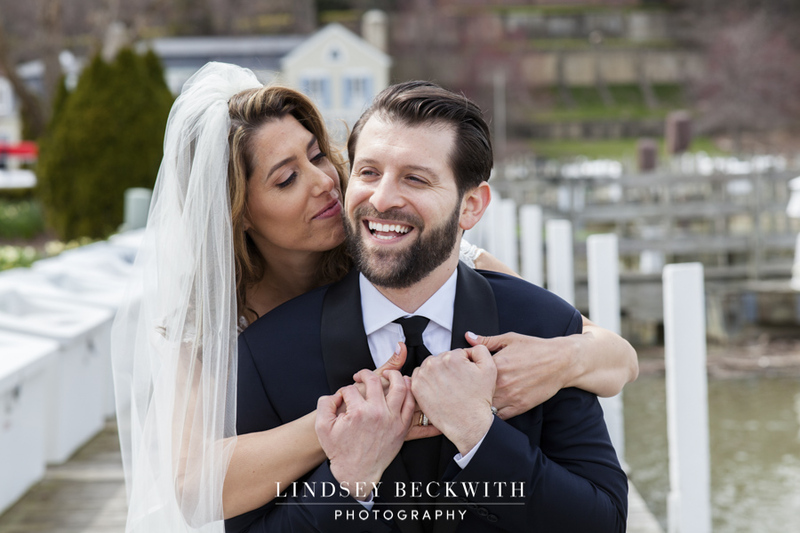 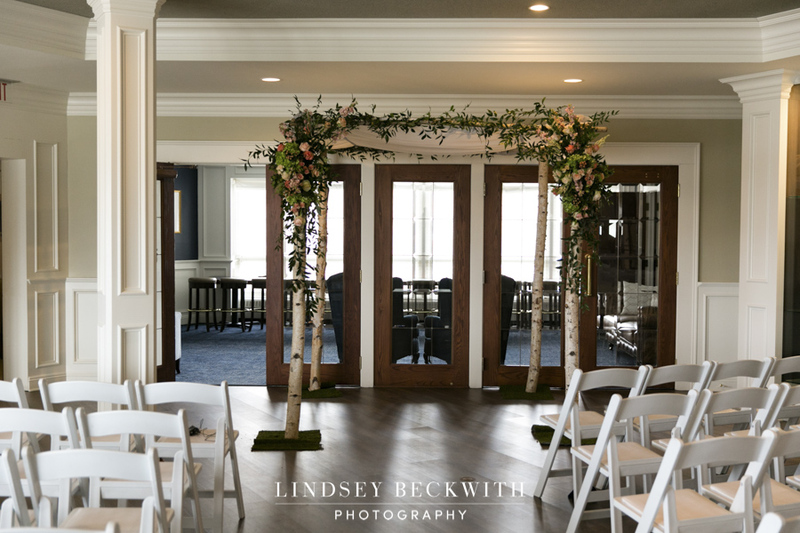 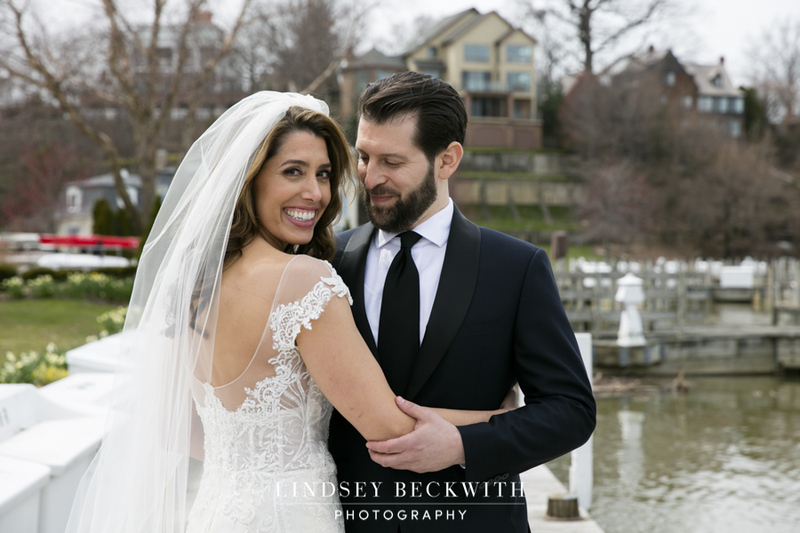 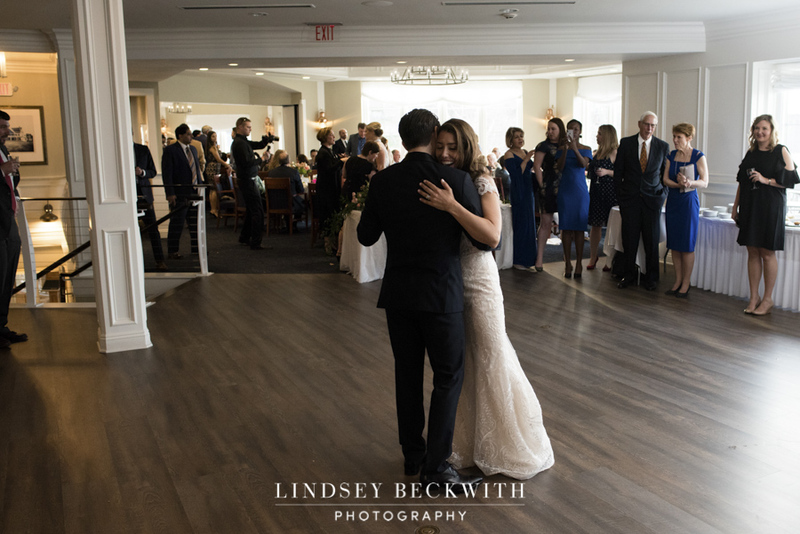 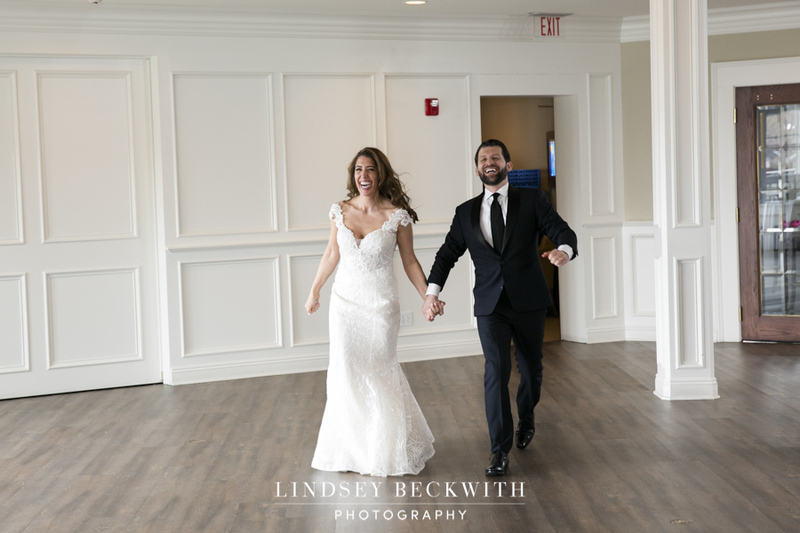 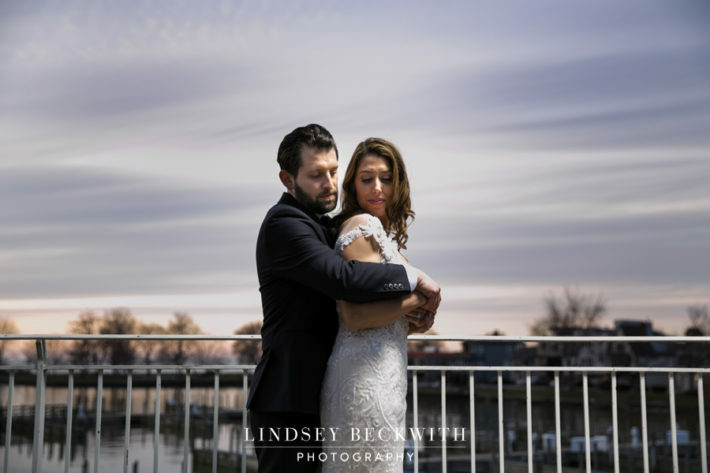 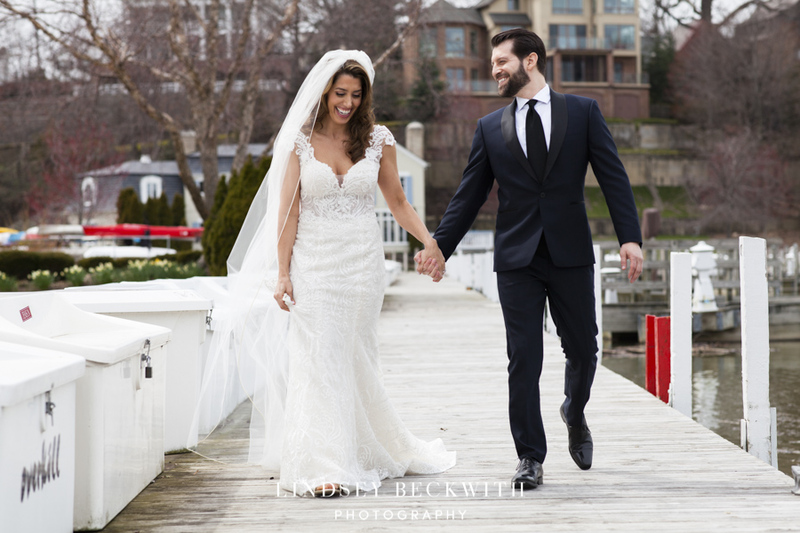 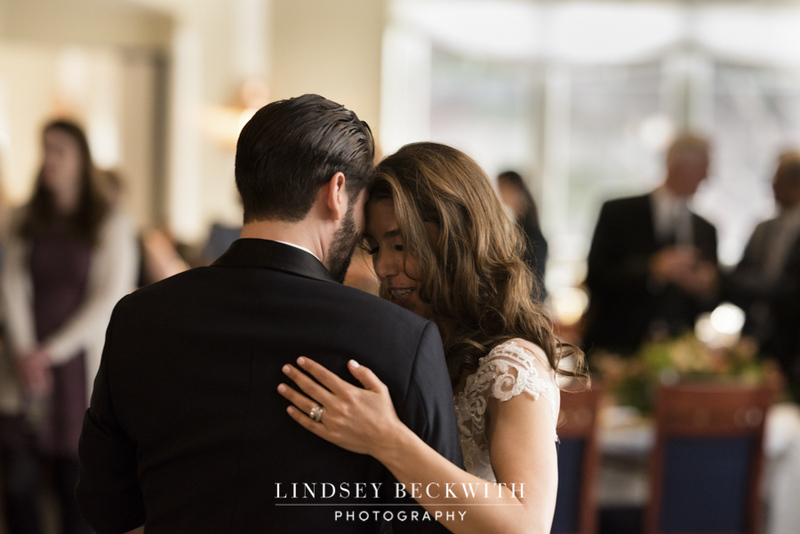 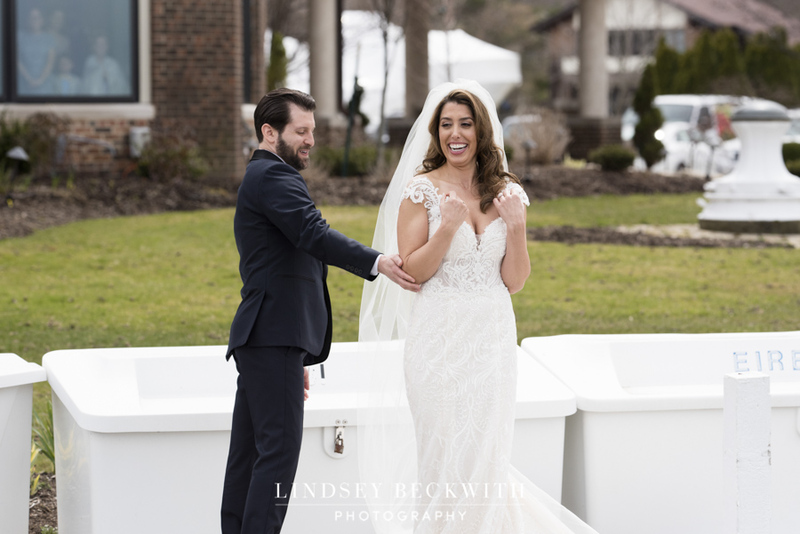 Here are some favorites from this beautiful, emotional lakeside wedding at the Cleveland Yachting Club in Rocky River, Ohio. 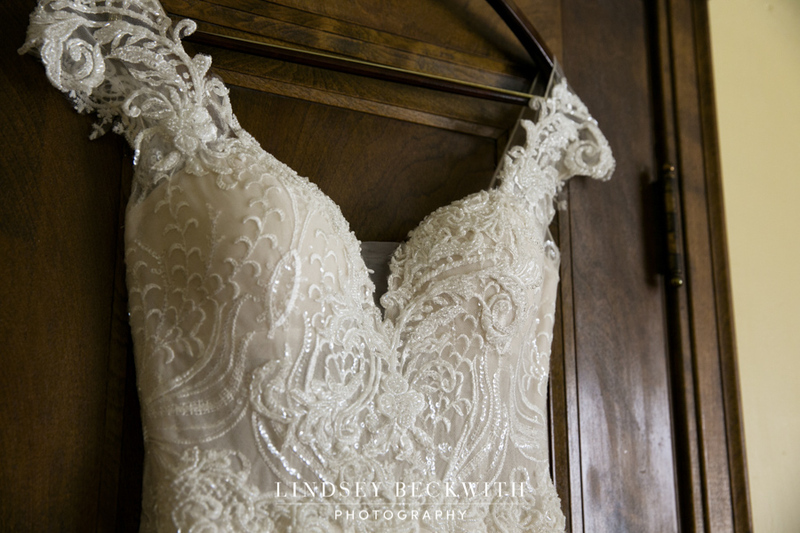 Wedding dress hanging against a wooden door. 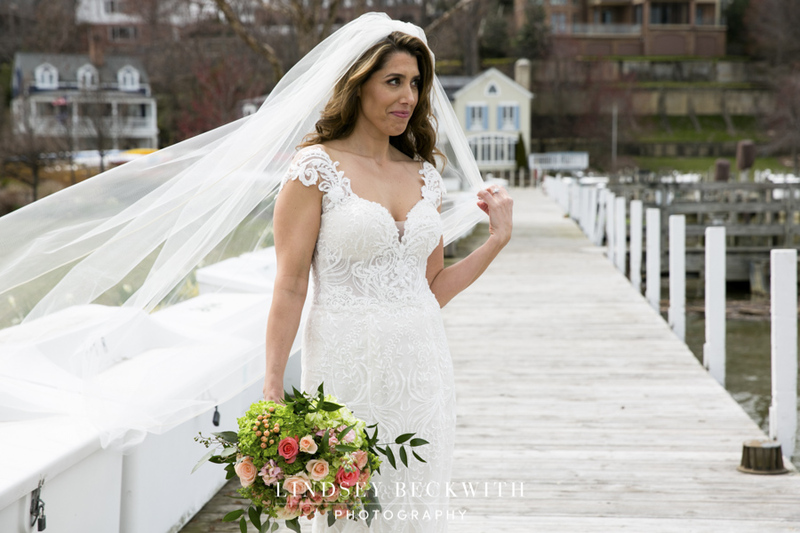 Kelly’s sister zipped her into her wedding dress in Rocky River, Ohio. 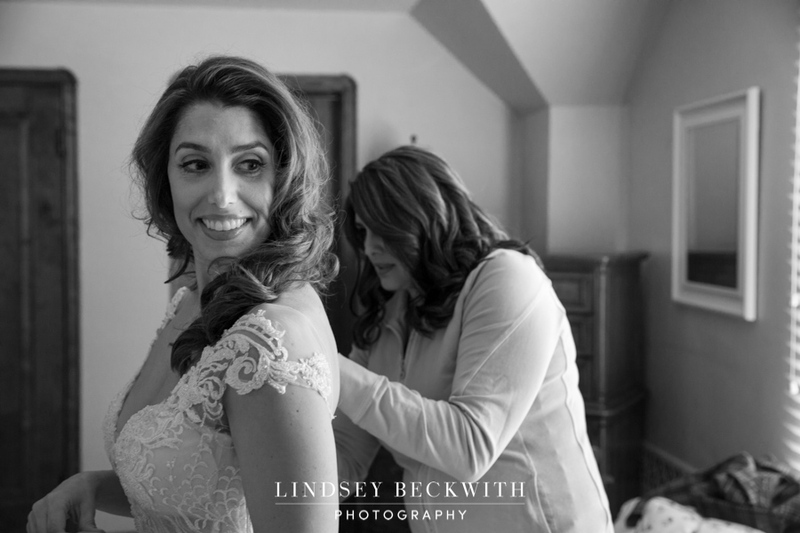 Rocky River bride getting ready. 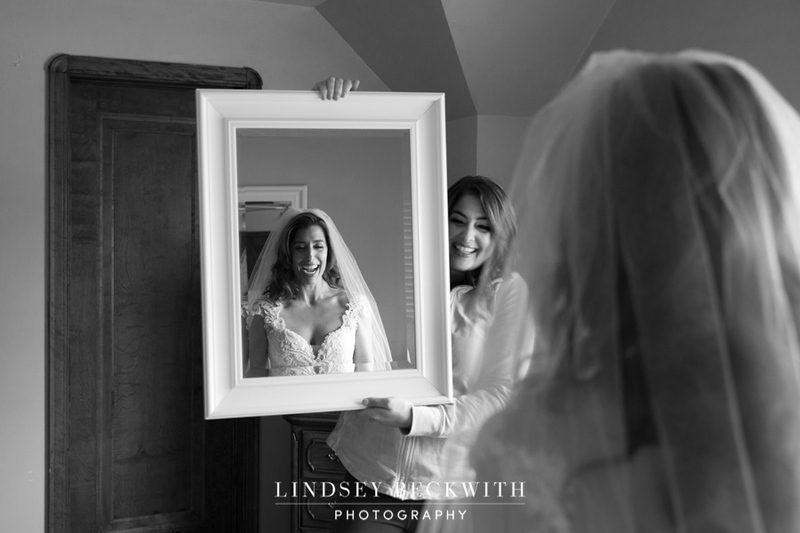 Kelly’s sister holds a mirror so she can see herself with her veil in place. 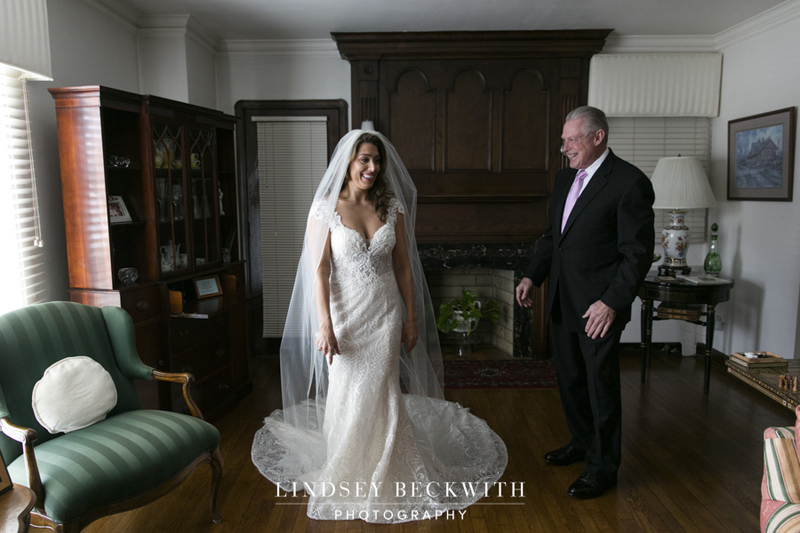 Bride taking a quiet moment to wipe her tears before doing a first look with her father. 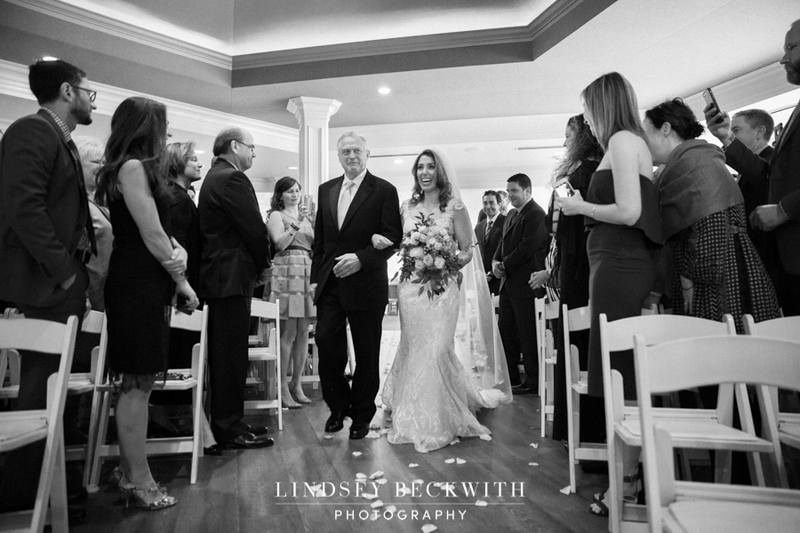 Father of the bride first look in Rocky River, Ohio.